Throughout this report, we refer to anyone who did one or more of these activities in the preceding twelve months as an online government user, and most of these online government users exhibit a relatively wide range of behaviors: the typical online government user engaged in four of these activities in the last year. The way we ask about the use of government services has changed over the years, making direct comparisons to our prior findings difficult. However, even accounting for these methodological changes it is clear that going online to complete basic transactions with government (such as renewing a license or paying a fine) is now much more commonplace than it was earlier in the decade. Conversely, online informational activities (looking up services, downloading forms, etc) are roughly as common within the online population as they were the last time we asked about these activities in 2003. Data driven – Efforts by government agencies to post their data online are resonating with citizens. Fully 40% of online adults went online in the preceding year to access data and information about government (for instance, by looking up stimulus spending, political campaign contributions or the text of legislation). These “government data users” are discussed in more detail in Part 4. Organized around new online platforms – Citizen interactions with government are moving beyond the website. Nearly one third (31%) of online adults use online platforms such as blogs, social networking sites, email, online video or text messaging to get government information. These “government social media users” are discussed in Part 2. Participatory – Americans are not simply going online for data and information; they want to share their personal views on the business of government. Nearly one quarter (23%) of internet users participate in the online debate around government policies or issues, with much of this discussion occurring outside of official government channels. These “online government participators” are also discussed in more detail in Part 2 of this report. At least when it comes to the federal government, these government data users tend to have more positive attitudes towards government openness and accountability. However, political ideology and partisan affiliations tend to outweigh this effect. Specifically, Democrats (and Democratic-leaning independents) tend to have more positive attitudes towards the federal government’s openness compared with two years ago if they go online for government data. On the other hand, Republican voters tend to cast a skeptical eye towards government openness whether they get this type of data online or not. More information about government data users can be found in Part 4. While many Americans interact with government using online channels, this engagement is not evenly distributed across the online population—particularly when it comes to income and education. 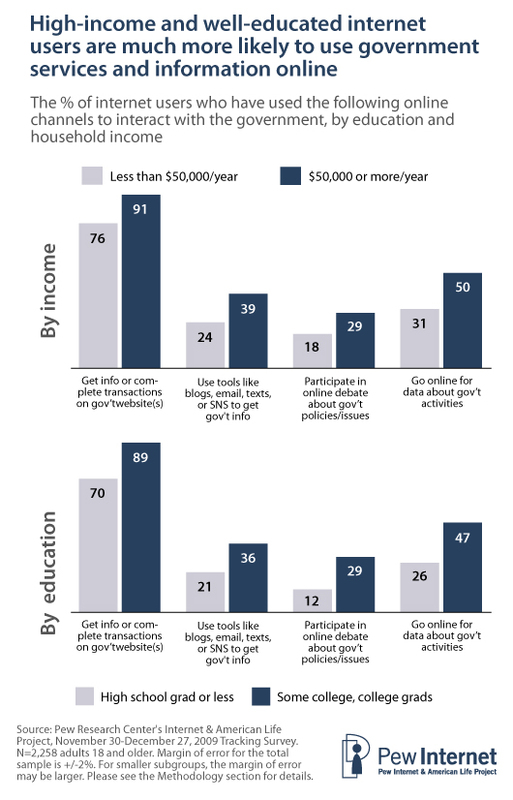 High-income and well-educated internet users are much more likely than those with lower levels of income and education to interact with government using many of the online channels we evaluated in our survey. There are also racial differences in the use of online government services. Whites are significantly more likely than either African Americans or Latinos to participate in the online debate around government issues or policies (25% of online whites do this, compared with 14% of African Americans and Latinos) and are also much more likely to go online for data about government activities such as stimulus spending or campaign finance contributions (42% of online whites are what we call government data users, compared with 25% of blacks and 29% of Latinos). However, these differences are more modest when it comes to completing basic transactions and information searches on government websites, and minority internet users are just as likely as whites to get information about government agencies using tools such as email, blogs, online video or social networking sites. As noted above, African Americans and Latinos are just as likely as whites to use tools such as blogs, social networking sites and online video to keep up with the workings of government. They also have very different attitudes towards the use of social media tools by government agencies and officials. 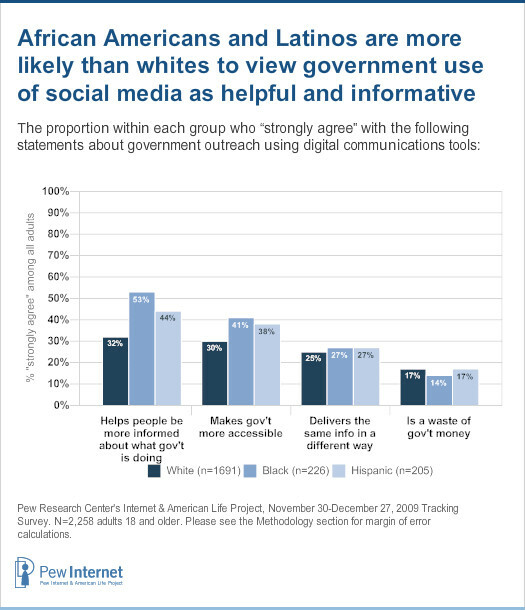 Minority Americans are significantly more likely than whites to agree strongly with the statement that government outreach using tools such as blogs, social networking sites or text messaging “helps people be more informed about what the government is doing” and “makes government agencies and officials more accessible”. 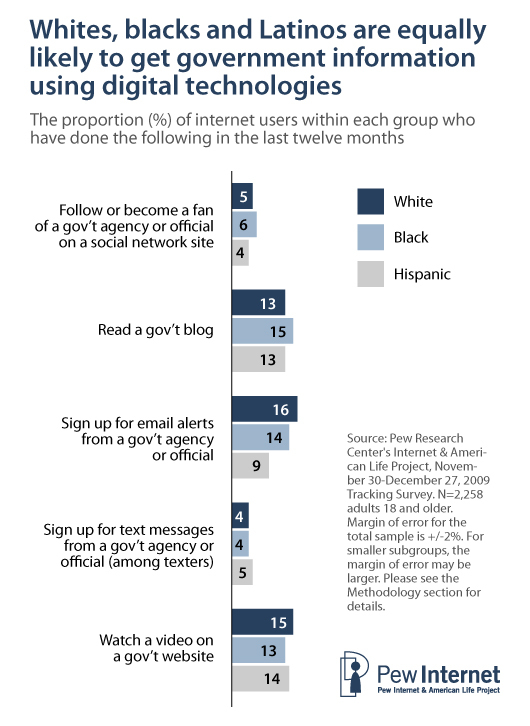 African Americans and Latinos are also much more likely than whites to say it is “very important” for government agencies to post information and alerts on sites such as Facebook and Twitter. Based on these users’ expressed attitudes, these tools may offer the ability for government agencies to reach underserved populations in a way that is not currently occurring with other online offerings. These findings are discussed in more detail in Part 3. As we found in our previous studies on this topic, search engines are frequently the first option when Americans need to find government information or services online. Fully 44% of those who could remember the last government website they visited found that site by conducting an online search. This is much higher than the percentage who visited a site they had used before (16% did this) or who relied on a friend or family member (14%), a government publication or notice (11%) or a general government website such as usa.gov (4%). Government website visitors are also generally successful in solving their problems once they reach their online destination. 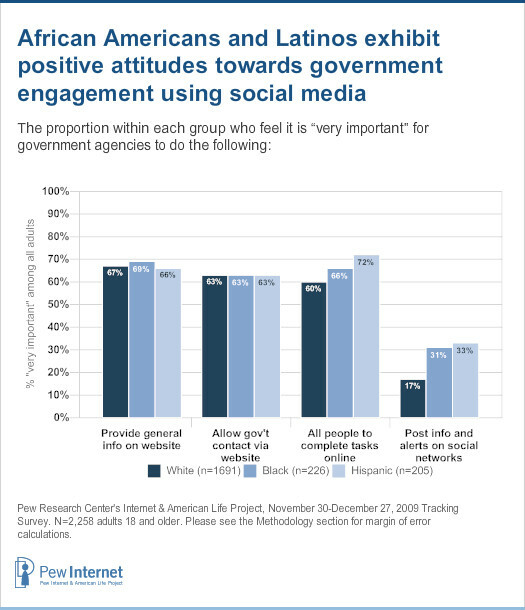 Half of government website visitors said that they accomplished everything they set out to do in their last government website interaction, and an additional 28% were able to do most of what they wanted to do. Just 5% said that their most recent government website interaction was completely unsuccessful. In this survey, we found that 44% of all Americans had contacted a government agency or official in the preceding twelve months via the telephone, a letter or in-person contact, and that these traditional methods are frequently used as a supplement to online information-seeking behavior. More than half of online government users have contacted government using offline as well as online methods. The continued relevance of offline channels can also be seen in the way Americans prefer to interact with government agencies. Among the population as a whole, Americans are somewhat divided on their preferred method of contact when they have a problem or question that requires them to get in touch with government. Being able to call someone on the telephone is the most preferred option overall (35% said this) followed by contact via email or a website (28%) and in-person visits (20%). However, internet users prefer online contact to the telephone—although not by a large margin (37% vs. 33%). The technologically proficient (those with a home broadband connection and mobile internet users) and those who engage in a wide range of online government interactions more strongly prefer online contact to other means. This report is based on the findings of a telephone survey conducted between November 30 and December 27, 2009, among a sample of 2,258 adults, age 18 and older. Interviews were conducted in both English (n=2,197) and Spanish (n=61) and a total of 565 interviews were conducted using the respondent’s cell phone. For results based on the total sample, one can say with 95% confidence that the error attributable to sampling and other random effects is plus or minus 2.4 percentage points. For results based Internet users (n=1,676), the margin of sampling error is plus or minus 2.8 percentage points.